Order in next 3 hours and 31 minutes for despatch today. 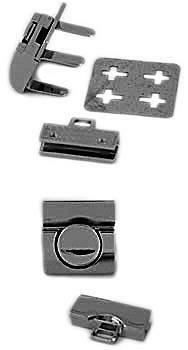 Nickel Tucktite Fastener for Briefcases and Bags. This replacement tucktite fastener or thumb catch, suits many bags. It is available in nickel finish only as shown. The overall size of the lock, when closed is 31mm x 29mm (wide). Comes complete with backplate and screws for fixing flap catch. This range of replacement parts is useful for practically minded people, who have a broken bag they do not want to part with and who do not have a saddler or luggage repairer in their neighbourhood.